Sunday, April 28, departing at 8:00am (7:30am from the subway). Cost: 380 RMB per person (340 RMB members); Difficulty Level 3. In Brief: Hike hill trails and valley paths to on the way to Shuiquan Canyon, a bouldery valley in the Longquanyu area. Autumn colours in the hills above the canyon. 3–4 hours of hiking over approx. 10km. Snacks and drinks provided after the hike. After a short stroll along the side of the main road, and a quick scramble up through a dip in the Longquanyu Great Wall, we walk down a hillside trail through fields and into a small village. The village is popular with weekend day trippers because it is right by the Longquanyu Great Wall, which we also love to visit for a day hike. But today the focus of the walk isn’t the Great Wall, but the Shuiquan Canyon, a bouldery canyon with a small stream that flows down towards the Little West Lake. On the other end of the village, through chestnut orchards and over the Great Wall again, we’ll find a steep track that leads down into the canyon. Once we’re down into the canyon we’ll follow a short section of the Little West Lake park trail up to the Black Dragon Pool. We’ll use stepping stones to cross the first part of the pool, and then cross over large boulders and a rushing stream as we exit the park area. It’s not far until the next big pool. Back in the day we used to have to use boats to cross this pool – it was either that or swim – but the boat team got kicked out for operating without permits and a little bridge was built instead. The little bridge isn’t in great shape, with some of the footboards missing. The frame of the bridge is solid, and you don’t need to worry about falling in the water. Beyond that pool, the path continues over and around boulders as we hike up to the head of the canyon and out to the village where we finish the hike. We used to do a version of this hike way back in the day, calling it 'Dragon Spring Valley'. If you’ve been hiking with us for a long time, you might recognise parts of this trail from other hikes in the area. 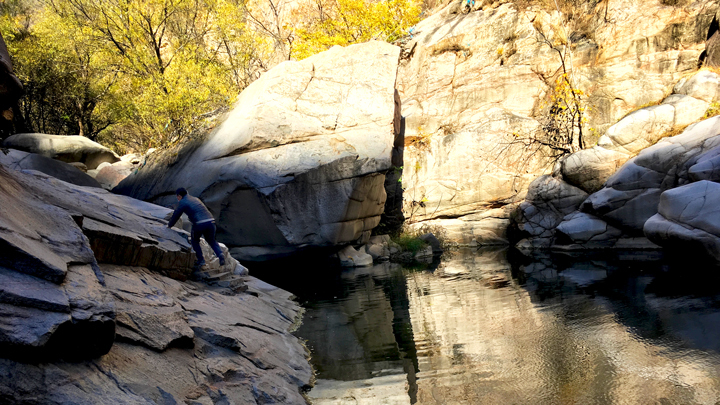 We revived part of an old trail to make a new-ish route—see a set of 20 photos of bouldery scenery and icy rivers from the Shuiquan Canyon hike. 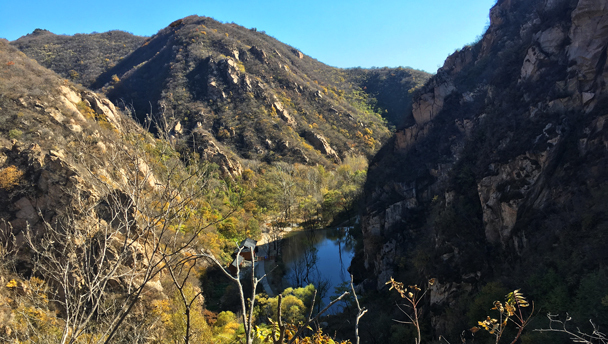 On this weekday visit to Dragon Spring Valley, we saw some great scenery – Great Wall, hills, valleys, and autumn colours – and we took a short boat ride as well!. Click through to see photos!